Trial by Fire is the tenth studio album by American rock band Journey. Released on October 22, 1996, the album marked the reunion of the classic 1980s lineup, which had not recorded together since 1983's Frontiers. Trial by Fire was produced by Kevin Shirley, who continues to produce the band's albums. The first album to feature bassist Ross Valory since Frontiers and the last to feature vocalist Steve Perry and drummer Steve Smith until the latter rejoined Journey in 2015. 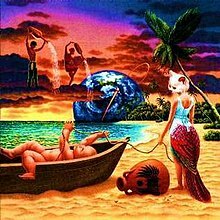 Trial by Fire is Journey's only album to not be accompanied by a supporting tour. That was due to internal disputes over a tour (originally scheduled for the summer and fall of 1997), as a result of Perry's hip injury as he prolonged getting the necessary surgery. If the band had toured, that tour would not have started until over a year after the album's release. Perry left the band feeling that he was being forced out. He was unsure about whether or not/ when to have necessary surgery and because of pressure to tour sooner than later. Drummer Steve Smith also quit citing that the band without Perry did not interest him. On November 9, 1996, the album peaked at No. 3 on the Billboard 200 and was eventually certified platinum in the United States by the RIAA. The band did not receive another platinum award until Revelation in 2008. Trial by Fire was Journey's first studio album in ten years, following Raised on Radio in 1986 and the band's subsequent split. Neal Schon and Jonathan Cain had formed supergroup Bad English and released albums in 1989 and 1991, while singer Steve Perry released his second solo album, For the Love of Strange Medicine (1994). While on a solo tour in 1994, it became apparent to Perry that "underneath it all, I was missing more and more being the singer in Journey than I ever thought I would." When A&R executive John Kalodner of Columbia Records suggested the band reform, Cain, Perry, and Schon began writing together. According to Perry, they wanted to "see if we had the spark to write again" instead of simply reforming for a comeback tour. "I was invited – and quickly uninvited," recalled Gregg Rolie, who had left in 1980. Perry said the band did not try to reinvent themselves on the album: "Nothing sounds more pretentious than someone being something they're not. One of the things we've always known is that there are certain musical directions that fit what [our] chemistry is about. We're going to sink or swim being what we are and not by trying to reinvent ourselves and not by trying to be the flavor of the month." ^ DeGagne, Mike. "Journey Trial by Fire review". AllMusic. All Media Network. Retrieved 2013-07-21. ^ a b c d e f g h i "Trial by Fire Billboard Singles". AllMusic. All Media Network. Retrieved 2013-07-21. ^ a b "Trial by Fire Billboard Albums". AllMusic. All Media Network. Retrieved 2013-07-21. ^ a b c RIAA Gold and Platinum Search for albums by Journey Archived 2015-09-24 at the Wayback Machine. Retrieved on 2013-06-30. ^ a b c Newman, Melinda (5 October 1996). "Columbia's Journey Gets Warm Welcome At Radio". Billboard. Nielsen Business Media. 108 (40): 13, 113. ISSN 0006-2510. ^ Ling, Dave (August 2001). "A beginner's guide to Gregg Rolie". Classic Rock #30. p. 67. ^ "Top Albums/CDs - Volume 64, No. 13, November 11, 1996". Library and Archives Canada. 11 November 1996. Retrieved 2013-07-21. ^ "Journey – Trial by Fire (album)". Swedishcharts.com. Media Control Charts. Retrieved 2013-07-21. ^ "Album – Journey, Trial by Fire". Charts.de (in German). Media Control Charts. Retrieved 2013-07-21. ^ "Album – Journey, Trial by Fire". GfK Dutch Charts (in Dutch). Media Control Charts. Retrieved 2013-07-21. ^ "Top Singles - Volume 64, No. 18, December 16, 1996". Library and Archives Canada. 16 December 1996. Retrieved 2013-07-21. ^ "Top Singles - Volume 65, No. 3, March 24, 1997". Library and Archives Canada. 24 March 1997. Retrieved 2013-07-21. ^ "Top Singles - Volume 65, No. 10, May 12, 1997". Library and Archives Canada. 12 May 1997. Retrieved 2013-07-21. This page was last edited on 16 April 2019, at 13:37 (UTC).